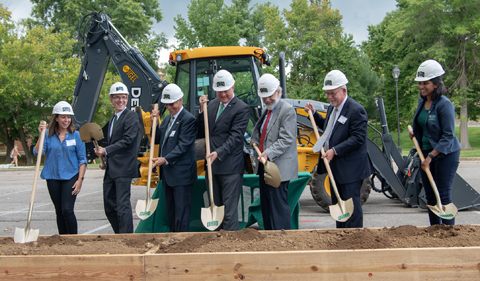 Ohio University President M. Duane Nellis called the groundbreaking for a new chemistry building “an exciting day for Ohio University” as construction gets under way on a major academic building on campus. 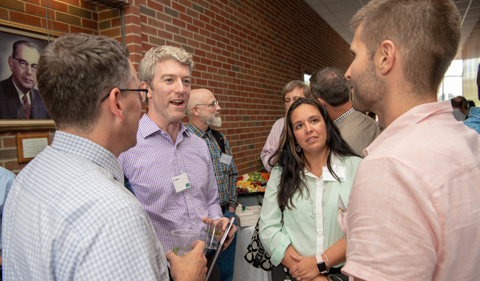 “It’s been a a few years since we’ve had a focus on a new building for the academic core of our university, and chemistry is certainly an important part of that,” Nellis said at the Aug. 30 ceremony. President M. Duane Nellis makes remarks at the groundbreaking ceremony for a new chemistry building at Ohio University. From left, Maddie Sloat, Student Senate President; Dr. Joseph Shields, Interim Dean of the College of Arts & Sciences; Dr. David Scholl, Chair of the Ohio University Board of Trustees; Ohio University President M. Duane Nellis; Dr. Chaden Djalali, Executive Vice President and Provost; and Maria Modayil, President of the Graduate Student Senate. “To the Ohio University Board of Trustees, thank you for your investment and support in approving funding for this project, and thank you to the many faculty and administrators and community partners who made today a reality. 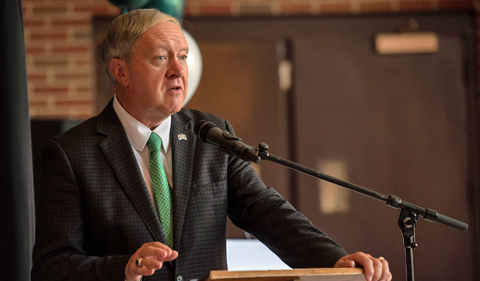 It truly is such an exciting time to be at Ohio University,” Nellis said, acknowledging the many people involved in the new building project. 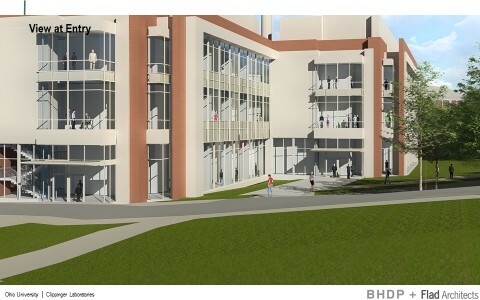 Architect’s rendering of the new Chemistry Building. Courtesy of BHDP + Flad Architects. Dr. Kevin King, left, and Dr. Corey Beck, welcome corporate community members Joe Walter and Becky ’94. Dr. Chaden Djalali, the university’s new Executive Vice President and Provost, said the building “will strengthen our educational community, enhance our national research and creative profile, and foster a culture of collaboration and exploration across the university. 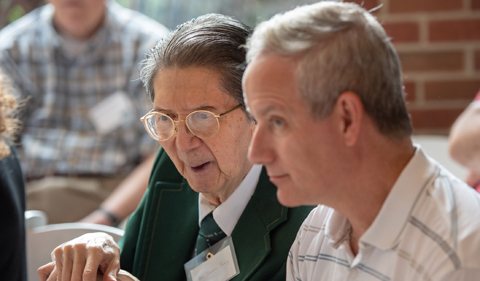 In doing so, we reaffirm the foundation of our educational mission and solidify our commitment to cultivating the next generation of scientists and scholars. 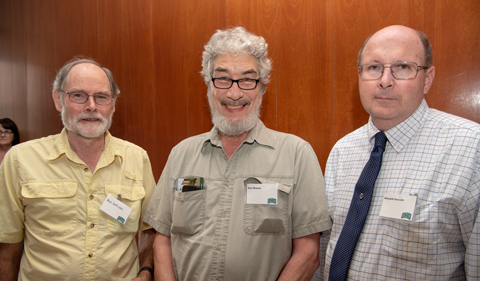 From left, professors emeriti Dr. Paul Sullivan and Dr. Kenneth Brown with Associate Provost Dr. Howard Dewald. 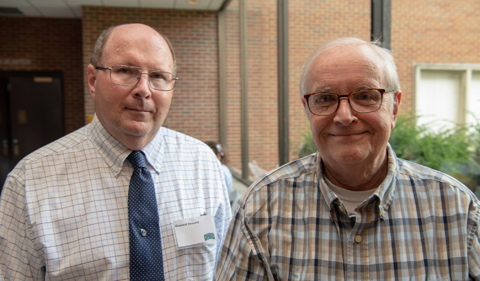 As Dr. Joseph Shields, Interim Dean of the College of Arts & Sciences, opened the ceremony in Clippinger Laboratories, he welcomed gusts to chemistry’s current home, “a place where I have worked, discovered, taught, and learned alongside many dedicated OHIO colleagues and students for more than 20 years. Professor Emeritus James Tong attended the groundbreaking ceremony.